In the above mechanism's first step, what motivates the use of the carbanion resonance structure of the enolate ion if the negative charge is better localized on the more electronegative oxygen? Edit: I might not have been clear in what motivates my confusion. Maybe I should rephrase what I'm asking. Basically, why would the carbon on the enolate attack the carbonyl carbon as opposed to the oxygen on the enolate attacking the carbonyl carbon? 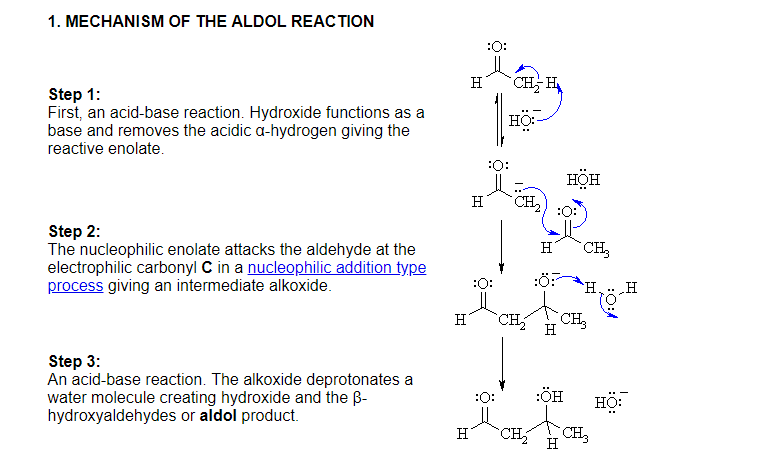 I assume there's a mixture of both products, but why is the aldol the major product? The negative charge is placed on the carbon atom to signify that it is the nucleophilic center which can attack the aldehyde. Indeed the negative charge is better placed on the oxygen atom, but after performing a nucleophilic attack on the aldehyde, an unstable acetal is formed reversibly. Not the answer you're looking for? Browse other questions tagged organic-chemistry reaction-mechanism aldol-reaction or ask your own question. Does OH- attack carbonyl carbon in aldehyde during aldol reaction?